Above you see both the postcard and the original photograph on which it was based. The view looks out over White Wharf at the U.S. Navy’s North Atlantic Squadron, which was a regular summer visitor to Rockport for many years. I believe that it was taken from the steeple of the Congregational Church. These images are from the Detroit Publishing Co. As I’ve noted in other posts, it was once one of the largest U.S. postcard publishers and was considered to have some of the finest images. It began producing postcards in 1897 and continued to do so until 1924. The postcard is copyrighted 1906. 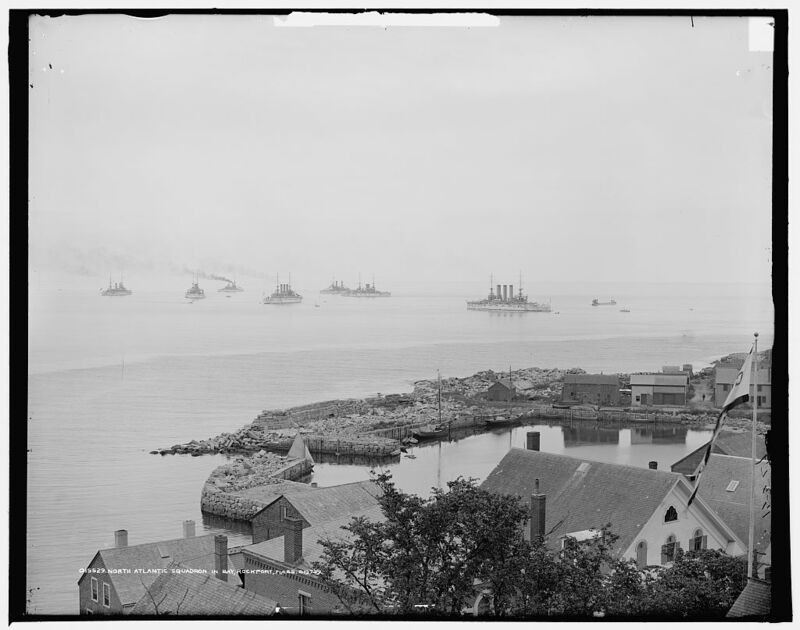 If that was the year the photograph was taken, then it was the same year as a newspaper article I quoted in another post, “Rockporters Agog Over Coming of Admiral Evans’ Fleet,” which described some of the festivities planned for the fleet’s arrival. As you can see in the pictures, White Wharf, which is now used for parking, was covered then with granite stones, presumably being used to build up the seawall that appears to be only partially complete in this picture. More recently, White Wharf gained a measure of fame as the locale of the Quikee Burger restaurant in the 2003 Farrelly brothers movie Stuck on You (although the movie pretended it was Martha’s Vineyard). This entry was posted in Uncategorized and tagged Detroit Publishing Co., Warships. Bookmark the permalink.